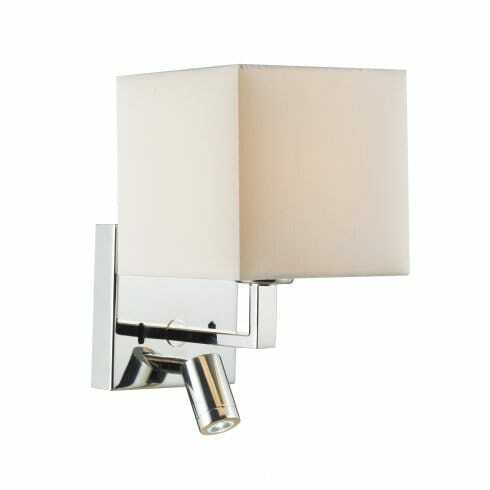 Dar Lighting Anvil single light wall fitting features a square wall plate with a fixed arm that supports a square cream shade. Underneath this sits a smaller angle adjustable LED task lamp that offers much convenience and practicality. With its simple, understated design this item is great for neutral and contemporary decors. The product code for this Dar wall bracket is ANV0750L. Operated by use of a 2 discreet rocker switches. Also available in a swing arm version (ANV0750S) or the fixed arm without the LED task lamp (ANV0750F), and is available to order with a selection of assorted shades. Please see our website for more details.